Today, I just wanted to share some new book releases coming in March that I'm only a little excited about. I read What I Didn't Say by Keary Taylor and loved it. I recently finished The Bane, and it didn't disappoint. Review coming on March 6. Just a little excited for this one. It's whatever. No big deal. Okay, who am I kidding? This is one of my most anticipated books of 2013. It's been a year since the cliffhanger in Pandemonium left us shattered. I can't wait to find out what happens to our heroine. Plus, I get to read another book with Melissa. It's nice to have someone who's only a Twitter message away to cry to. Another one of my most anticipated books of the year. I am going to gobble you up. What new book releases are you anticipating in March? THE BOOK CHAT IS CELEBRATING ITS FIRST BIRTHDAY TOMORROW! For tomorrows book chat, you can choose any topic from the last twelve months and link up. Here are all of the prompts. Also, for the first time, I am linking up with Breaking the Spine for the Waiting on Wednesday link-up party! I hope to make a habit of it. That's all for today. I hope to see you all tomorrow! jodi picoult also has a new book that came out yesterday! I'm reading What I Didn't Say right now! I bought it after you reviewed it, and I'm just now getting around to it. And HAPPY BIRTHDAY BOOK CHAT! So exciting. 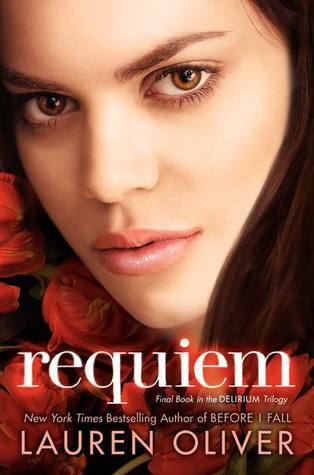 I can't wait for Requiem to come out! I'm glad I waited to finish the second book. I don't think I could have taken the torture of waiting a whole year to find out what happens! Waiting a few weeks is hard enough. I'm so excited to read it BUT I know as soon as I'm finished I'll be really sad that it's over. REQUIEM!!!!!! Also, Book Chat! I actually can't believe it's been a year. Time flies! I am most likely way too excited for Lover At Last this month. Qhuinn is one of my favorite characters and I need to read his story! And I'm going to pickup Lauren Oliver's book based on your enthusiasm. I look forward to reading your twitter messages. I cannot WAIT for Requiem, I was in total shock when I finished the second (I was in the bath and kind of yelled, my fiance came running into see if I was okay! ).